For the last couple of years I’ve been part of an AHRC-funded Iconoclasms network, led by Leslie Brubaker and Richard Clay (University of Birmingham). Regular Golovine readers might remember my post about our last network meeting at the University of Notre Dame. At the beginning of October 2013 the network met in London to attend the opening of the exhibition Art Under Attack: Histories of British Iconoclasm at Tate Britain. In the exhibition it was amazing to finally see the objects that the co-curators Tabitha Barber and Stacy Boldrick had shown us on power-point slides in previous workshops and to walk through considering them in relation to the wider histories and cultures of iconoclasm that we have explored as part of the network. The exhibition is the first to deal with the subject of British iconoclasm and it has attracted a fair amount of intrigue and discussion. Art Under Attack shows that iconoclasm can take varied forms, that objects and images do not provoke attacks, but that political, social and religious change or periods of unrest have been the catalysts for many acts of destruction, and, importantly, it highlights the strong bond between iconoclasm and creativity in Britain. Penelope Curtis, the director of Tate Britain, has noted in the foreword to the exhibition catalogue that the earliest work at Tate dates from 1545, defining the collection as post-Reformation. Iconoclasm existed in Britain long before the Reformation, but in terms of Tate’s collection it is a significant moment from which to historicise the subject in Art Under Attack. Naturally, the exhibition begins with the dissolution of the monasteries during the reign of Henry VIII. At this time, Protestant Reformers feared that people adored religious statues and paintings instead of God, committing the sin of idolatry. Thus, during the reigns of Edward VI and Elizabeth I images in churches were removed or damaged. In the exhibition, surviving headless statues from churches, as well as saints scratched out from altar paintings might signify to modern British viewers our ‘lost’ medieval cultural heritage, but which, for post-Reformation England, were reminders of the sinful idolatry of the past. The Reformation had a radical impact on visual culture in Britain and subsequent image production was informed by this period of destruction. Art Under Attack includes examples of seventeenth-century reformers replacing the visual images that had formerly decorated churches with words from the Bible, while campaigns of destruction escalated. The earlier examples of iconoclasm in the exhibition are presented in terms of religious reform and they were sanctioned by the state, while exhibits relating to attacks from the late seventeenth to twentieth centuries are typified by political upheaval. Representations of political figures have been attacked throughout history, often in response to, or as a precursor of actual political change. The struggle for independence in Ireland led to many equestrian statues of British monarchs being melted down or destroyed. Interestingly, the eighteenth-century statue of George I standing outside the Barber Institute escaped a similar fate when the Dublin-born director Thomas Bodkin bought it in 1937, transforming it from a political symbol in its original setting in Dublin to a work of art in its new home in Birmingham. The art gallery is a place in which the visitor can revere images. In this way, it seems less surprising that in the early twentieth century Suffragettes attacked paintings in public galleries. Mary Richardson slashed Velazquez’s Rokeby Venus, angered by the idolising of this painting while Emmeline Pankhurst’s suffering was ignored. Responses to the attack in the press further outraged the Suffragettes because the damage done to an inanimate object was mourned, yet women continued to be ostracised. Therefore, further attacks on paintings were carried out. The exhibition shows a photographic reproduction of the slashed Rokeby Venus, while the original painting hangs in the National Gallery as an iconic, intact image with a crowd of visitors in front of it. Other paintings, such as Pre-Raphaelite works that were attacked by Suffragettes and subsequently restored, are included in the exhibition and their presence as unbroken objects is a visual surprise after seeing so many fragments and clearly transformed images. As a result, we can understand the outrage that the attacks would have caused – after all, they are inoffensive, typically beautiful paintings. This is a thought-provoking stage in the exhibition that resonates with recent attacks on works of art, it does not justify such attacks but it allows us to consider the act of iconoclasm as a form of expression, rather than only focusing on the work targeted. In the case of the Suffragettes, this was a desperate time in which their freedom of expression was restricted. Perhaps the difficult question raised is whether works of art are targeted solely to attract publicity. In any case, historically, the media has played a significant role in how we perceive such attacks. Following on from the section dedicated to the Suffragettes, the focus remains on the public art gallery as a site of iconoclasm by exploring works that have been attacked by individuals who were seemingly offended by what those works represented, or whose outrage was caused by the fact that public money was used to purchase those works. Ironically, in their reviews for Art Under Attack, some art critics show sympathy for the acid attack on Allen Jones’s Chair because they do not like the sculpture, and yet, those same critics disparage Mary Richardson’s attack on Velazquez’s painting. The exhibition questions responses to iconoclasm in public galleries, which, regardless of the motive, judge the attack in relation to the supposed value of the object, be it aesthetic, cultural, financial, or otherwise. There is a clear divide in responses to attacks on historical works and those on works by living artists. Therefore, it is not surprising that some critics have responded negatively to the contemporary works in Art Under Attack. The latter sections of the exhibition are focused on aesthetics, beginning with post-war artistic responses and theories. In the case of the ‘Destruction in Art Symposium’, artists created socially and politically engaged auto-destructive art. These artists were influenced by iconoclasts and they explored the creative force of destruction, which, in turn, has inspired the next generation of artists whose works are shown in the last room of the exhibition. The visitor’s journey through 500 years of British iconoclasm started with destruction in religious sites and ends in the space of the art gallery, which is a contested sphere for image-makers and -breakers. The exhibition draws to a close with Jake and Dinos Chapman’s series One Day You Will No Longer Be Loved – nineteenth-century portraits whose depicted sitters have been altered by the Chapman brothers to appear as decaying, like their actual bodies. The original paintings had been sold off and due to the age of the paintings we can deduce that the sitters have been dead for quite some time, and therefore, were no longer loved as people or paintings. The Chapmans’ iconoclastic approach unsettles many viewers and, I think, within the parameters of the exhibition, their series points to the quasi-sacred value of works of art, therefore, revealing why acts of iconoclasm are so disturbing. Art lovers, particularly art critics and even some art institutions have been troubled by the idea of an exhibition about iconoclasm; perhaps that fear can be compared to the Protestant Reformers who destroyed images to protect religious worship. Contemporary artists and subversive curators are a threat to the established order of idolised aesthetic beauty, so their critics attack them with words. In my view, the exhibition is brilliant because it challenges the viewer by scrutinising key moments in British history and questioning traditional representations of them, as well as positioning the art gallery within the history of British iconoclasm. Art Under Attack shows that people have always destroyed images and objects, and always will, but it encourages us to think about the discussions that take place afterwards, the myths created and the rationalising of the motives. My opinion is of course biased so I encourage readers to see the exhibition and make up your own mind. 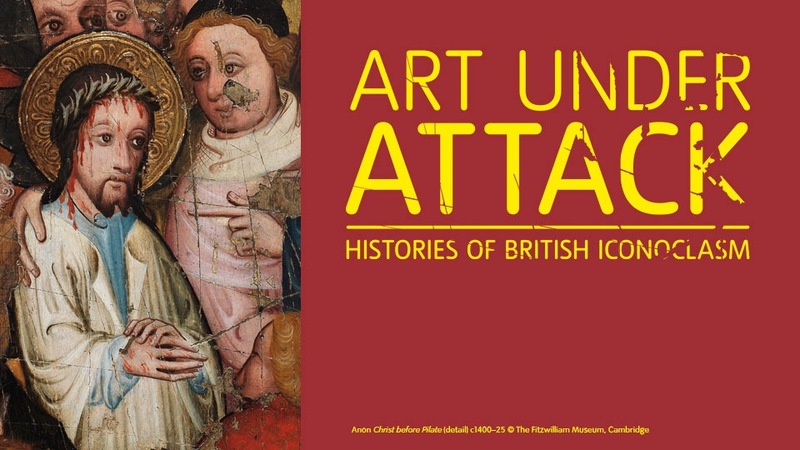 Art Under Attack: Histories of British Iconoclasm, Tate Britain, London is on until 5th January 2014. And what’s more, if tickets are ordered online between now and the 23rd December, then you can get them at the discounted price of £10 (use promo code christmas2013 on the bookings page).